I want you to meet Mik. He is my nephew in Lake Tahoe that is attending college in Santa Cruz. He was home on break when we were visiting so we were lucky enough to ski with him. He is a competitive trick skier and very knitworthy. He had my son Nik all over the slopes.....he slowed way down to keep me company. He put on the hat I made him(like three years ago and never put in the mail to him) and wore it almost the whole time we were there. 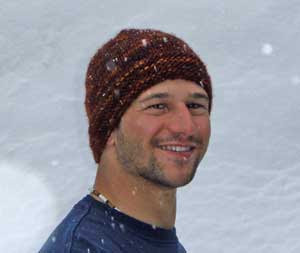 Not only is he knitworthy cuz he loved his hat but also 'cuz he looks so smashing in the hat!